It is hard to overstate the importance of insurance in personal and commercial life. It is the key means by which individuals and businesses are able to reduce the financial impact of a risk occurring. Reinsurance is equally significant; it protects insurers against very large claims and helps to obtain an international spread of risk. Insurance and reinsurance play an important role in the world economy. It is an increasingly global industry, with emerging markets in Asia and Latin America developing apace. Given the expanding reach of the industry, there is a need for a source of reference that analyses recent developments in the key jurisdictions on a comparative basis. This volume, to which leading insurance and reinsurance practitioners around the world have made valuable contributions, seeks to fulfil that need. I would like to thank all of the contributors for their work in compiling this volume. Looking back on the past year, 2017 is likely to be one of the costliest years in the history of the global insurance industry. Market estimates suggest that the final bill for the hurricane trio of Harvey, Irma and Maria, together with other natural catastrophes including a severe earthquake in Mexico, will come to US$135 billion. Overall losses (including uninsured losses) are likely to amount to US$330 billion, which would be the second highest ever recorded for natural disasters (topped only by 2011, which saw the Tohoku earthquake in Japan). It is estimated that the US share of losses in 2017 will be larger than usual: 50 per cent compared with the long-term average of 32 per cent. In Europe, a late frost after a long warm period in spring caused billions of dollars' worth of damage to crops while, tragically, some 2,700 people lost their lives following an extremely severe monsoon in South Asia. Events such as these test not only insurers and reinsurers but also the rigour of the law. Insurance and reinsurance disputes provide a never-ending array of complex legal issues and new points for the courts and arbitral tribunals to consider. 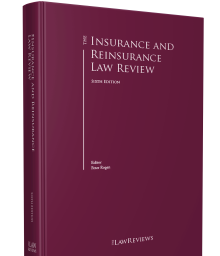 I hope that you find this sixth edition of The Insurance and Reinsurance Law Review of use in seeking to understand them and I would like once again to thank all the contributors.